Willie Nelson's bass player Dan Edward "Bee" Spears and 5 others were cited for marijuana and/or moonshine charges by North Carolina Alcohol Law Enforcement Officers while Willie Nelson's tour bus was parked outside the Kenansville, NC venue where Wille Nelson & Family were scheduled to perform yesterday evening. 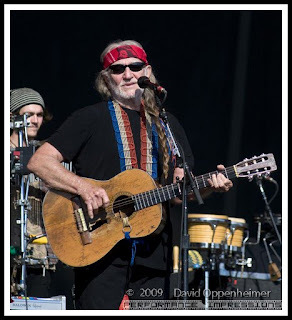 At the same time, Willie Nelson's left hand began to hurt him. His left hand was operated on in 2006 to treat carpel tunnel syndrome. Willie has asserted through his publicist and his daughter that it is because of his injured had that the shows have been postponed. Willie Nelson's concert in Asheville is being rescheduled with new date to be announced soon. With the half foot of snow and icy conditions expected tonight in the mountains of North Carolina, postponing tonight's show was not a bad idea.